The tree removal North Shore activity has been debated lately due to its increased demand and the impact it has on the area, in particular on the ecosystem services. On one side is the need for growth and development required to accommodate the greater residential demands in the region, which translates into an increased urban density in the area. Furthermore, the need for preventive measures to secure the safety of the population, goods, and properties against bushfire, lead to the introduction of a state government legislation allowing any trees within 10 meters of a home and underlying vegetation within 50 meters of a home, to be cleared without any permission needed. On the other side is the need and importance of the trees and vegetation, and the vital role and contributions they add to the environmental quality. To facilitate those developments and sustain the safety measures in place, there is a need for vegetation clearing and implicitly tree removal North Shore. This vegetation clearing does not have to disregard or have a negative impact on the environmental quality in the area. There are different measures that can be taken to support the much-needed development in the area and the nature of the ecosystem services. Development and environmental health do not have to be two rival notions. There is important to understand that the vegetation on private properties plays an important role in the ecosystem as well and does not just contribute to the landscape. Also, needs to be known that the health of the trees and plants is crucial for the general health of the vegetation in a particular area. It is though imperative to remove any severely sick trees, which cannot be saved, from your property. Also in some cases, a tree might be a hazard for your house or other structures on your property and will need to be removed and either be replaced with a different type of tree or have the same species of tree replanted in a different place on your property. Experienced and knowledgeable arboriculture specialists will be able to advise on the best way to keep your house and goods on your property safe, and also a healthy, thriving garden which will improve the look of your property and contribute to the quality of the North Shore environment. At North Sydney Tree Services, we can remove any “tree problems” from your property, whatever the size of the tree. Our experienced arborists understand trees and know the different actions will be suitable for different types of trees. 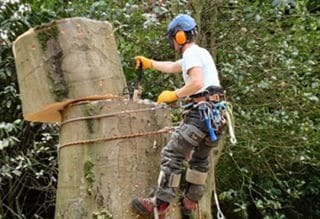 We can also advise you if a tree needs to be removed and of the best way of removing it. We are proud of our reputation as proficient and efficient when it comes to tree services. If you need tree removal North Shore services, please do not hesitate to give us a call on 0429 399 399 for a FREE quote. We always do the best we can to provide our clients with the best services.